In Another Time, Another Place--This Could Have Been The Kims. Perhaps Then They Wouldn't Be So . . . Ronery. In the dismal, crumbling concrete tomb that is Pyongyang, there are small but increasingly hopeful signs of life. In a touching moment of bonding, dying despot Kim Jong-il is reportedly spending quality time with his youngest son and chosen successor, Kim Jong-un. ‘Lil Kim is said to be teaching ‘Lil ‘Lil Kim about the trials and tribulations of statecraft by launching an unprovoked attack on a South Korean island. Father And Son: Only A Few Short Feet Separates Them, But They Are Divided By A Chasm As Huge And Unrelenting As Heartbreak. 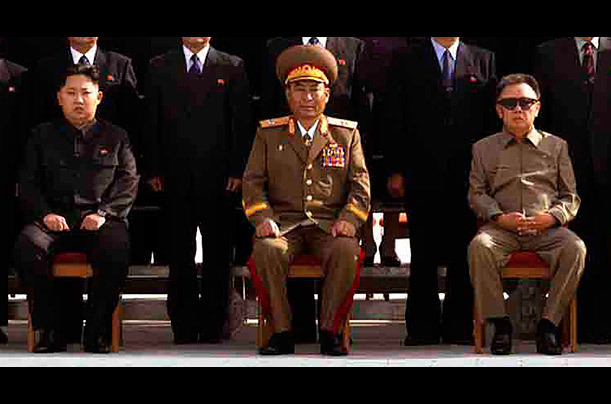 Launching a sneak attack against neighboring South Korea is thought to be an excellent bonding opportunity for North Korea’s two most powerful men, as Kims ‘Lil and ‘Lil ‘Lil are both fans of large-scale violence. According to sources, the elder Kim wants to show his son that the international community will huff and puff, but that as long as the repressive third-world regime dangles the nuclear carrot, will stand by helplessly. Sources close to Pyongyang, who agreed to speak to Promethean Times upon conditions of anonymity and after being provided with food, said that Kim is doing more than preparing his son for leadership. “The Great Leader is hoping that by spending time with the boy, it will bolster his self-esteem. When the younger Kim is feeling better about himself, we expect to see an end to his Glorious Blossoming,” he said, employing the official euphemism for ‘Lil ‘Lil Kim’s ‘Lil weight problem. 'Lil 'Lil Kim Awaits Reaction To His New PR Campaign: "Meet The Un-Kim." *Please read here for more details on ‘Lil Kim’s unusual accent.